Whether in the heart of midtown or down on the Lower East Side, you’re never far from Dr Smood. And we are so grateful that this chic Miami-based juice bar and wellness cafe has been popping up all over New York with a philosophy of wellness-based eating with products infused with super foods like maca, matcha, ashwaganda and turmeric. Everything is 100% USDA organic. Even the “power pastries” that are a favorite of ours (and perfect for the mini-set too) featuring cacao, dates, honey and coconut. Not to mention, the minimalist, glossy setting offers the wellness set a super stylish space to enjoy a vitaian booster. After just one visit we had to find out more, the who the what and where behind the incredible cafe. 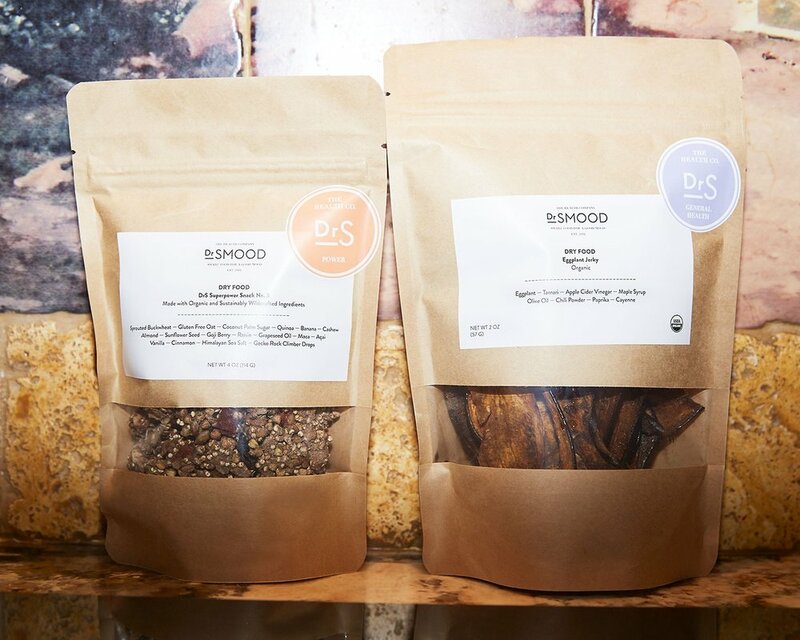 So we sat down with Dr. Etti, a holistc nutritional doctor in her own right who has been working with the Dr Smood founders on creating their tasty, healthy concoctions. Check out our interview below. Full disclosure. We are obsessed with Dr Smood. Can you tell us about your background and what led you there? My background is in Holistic Nutrition and Family therapy. I created a seven-day juice cleanse program called Sexi Juicing have been guiding groups through detoxification for 17 years. René and Patrizia Sindlev, our founders, and I connected four years ago. We joined together because we are very passionate about leading a healthy lifestyle; eating healthy food and shifting the way people in America perceive healthy food. René, Patrizia and I recognized that there is a problem with the SAD (Standard American Diet)—which is the cause of most chronic diseases—and we wanted to be part of the solution. So interesting...and was there a trigger moment in realizing you had to join this brand? Yes!! It happened over dinner with our VP (Francesco Perillo), when we were discussing the impact Dr Smood is going to have in America and the world. He said something that touched me deeply—he said, “We get to leave a LEGACY.” I had an awakening when I was 40 years old and my life’s purpose from that point on was to GIVE—by sharing my knowledge, wisdom, and healing and inspiring people to do the same. Amazing. So what is your role at Dr Smood specifically? How would you describe the vision of Dr Smood and how does it differ from other holistic meal/juice brands on the market? We believe that Dr Smood is the solution for our health crisis and we are offering the food for a better future. We need to help to create better health for Americans today. We make it easy for people to eat healthy—we have over 90 products for breakfast, lunch and dinner. We want every person that comes into our store to find something to eat, whether they are a meat and potato person or a vegan. To ensure this, we have a broad range of menu items, including turkey, smoked salmon and tuna sandwiches; vegan salads and sandwiches, a selection of healthy snack options and our popular breakfast items. Finally, our cafés have a very warm European ambiance, making for perfect combination of a pleasurable, healing experience. Yes, we totally agree ! We love hanging out at Dr Smood (Soho is our go-to). Can you speak to the science behind Dr Smood's programs? Studies indicate that mostly plant-based foods that are alkaline and infused with super and medicinal foods are anti-inflammatory and help prevent diseases. We are also aware that organic foods are much better for our health since conventional food is laden with chemicals that are then stored in our body, causing disease. Most of our food is live: smoothies, juices, salads, pancakes, vegan milkshakes, desserts etc. Live food is tasty and filling because it is alive (it contains more enzymes, vitamins and minerals), and is full of fiber. You're a mama, can you tell us how do you try to stay balanced and sane while being a partner at a brand and raising children? As a single mother of four, I have a very hectic work schedule—I strive for a balanced life. A full life that will include enjoying one-on-one quality moments with my kids and my boyfriend, connecting with my women tribe, staying in touch and in tune with the cutting edge of healthy nutritious products, doing my volunteer work and having quality time for myself. I try to stay calm in the midst of the storm. Calmness is a state of mind that can be achieved if and when we nourish our bodies, mind and spirit, by eating healthy, exercising and meditating. I also go on a juice cleanse four times a year. I usually don't have time to juice myself, and fortunately I created a user-friendly detox program that are easy to follow and really yummy. I usually choose Dr Smood’s program number 2 - which is the intermediate level juice cleanse. I also developed a beginner and advanced detox program to benefits all levels of detoxers. My therapy is dancing—it allows me to be in the moment. I breathe and let everything else go. I also love hugs—the more the better. TOTALLY. How does your philosophy on wellness impact the choices you make for your kids? My philosophy in regard to food and everything else in life is to be a purist. Choose the best quality of whatever you put into your body or mind and let your spirit soar. I let my kids choose what they want to eat as long as it’s the best quality. Pizza can be great if it’s organic and gluten free. Each and every one of my kids are aware of the connection between the quality of food and the quality of their health and most of the time they choose very wisely. I model by example and most time they like what I make. Living a meaningful life. Sharing my love and wisdom and making a difference. Inspiring our customers to strive for the best health ever, so they can be fully available to explore life’s opportunities and the sky is NOT the limit.